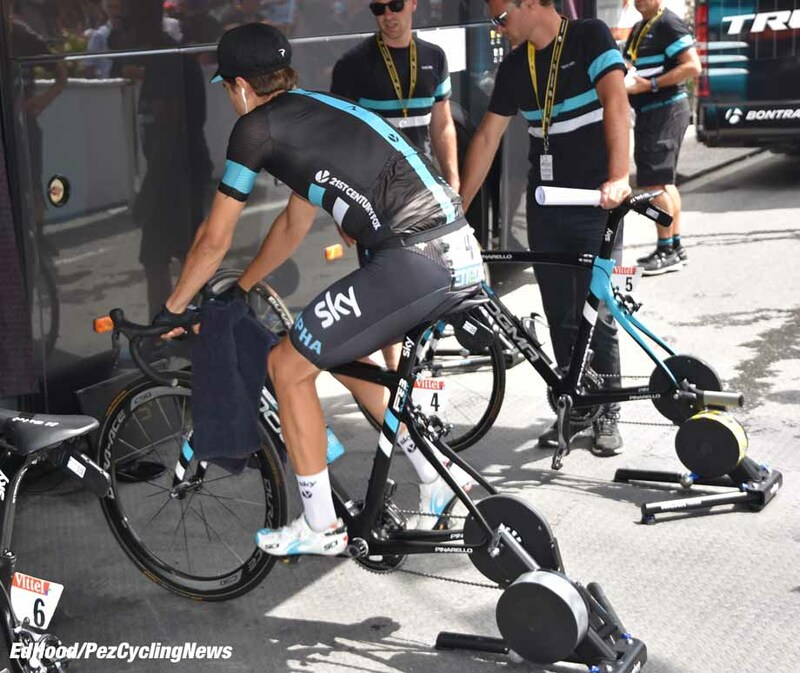 PezCycling News - What's Cool In Road Cycling : TDF’16 Roadside: Froome Flies On Hinault’s Hill! 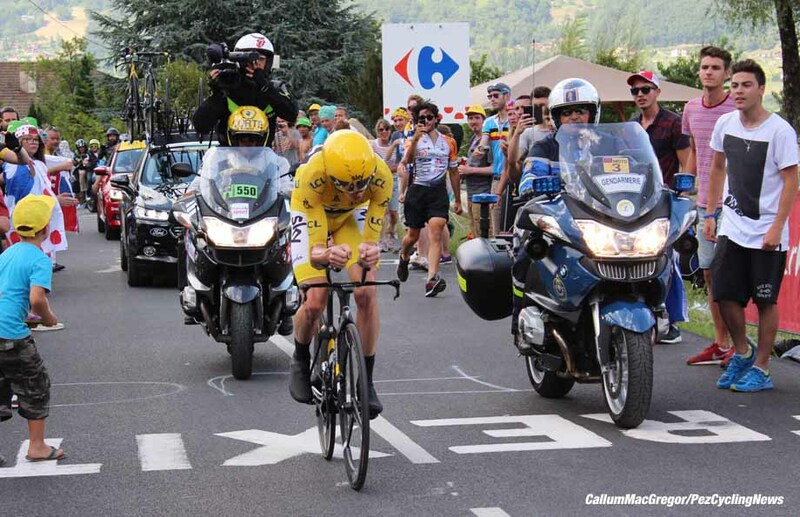 TDF’16 Roadside: Froome Flies On Hinault’s Hill! 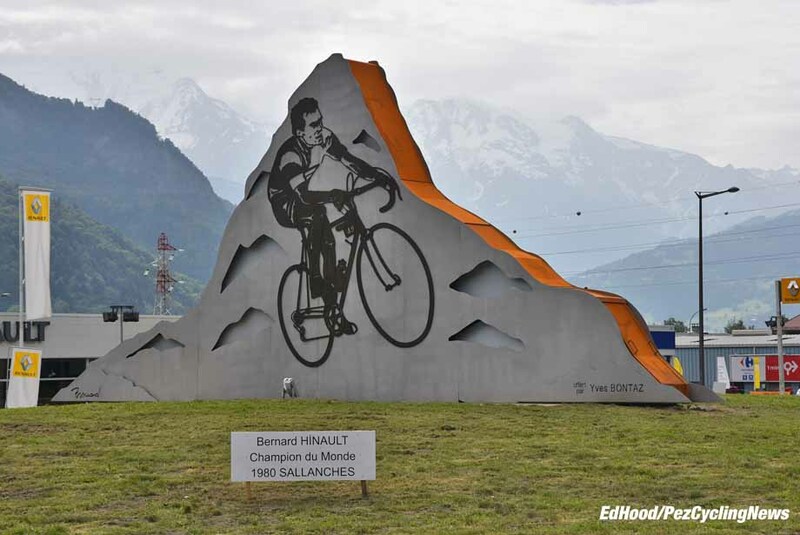 TDF'16 Roadside: Sallanches is a mythical place for cyclists, especially French ones by the name of Bernard Hinault. This is where 'The Badger' won his rainbow jersey by wearing the opposition down on one of the hardest Worlds parcour. 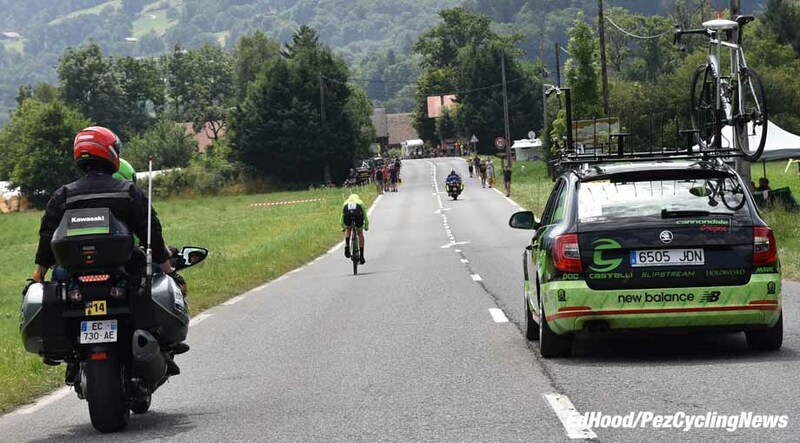 Stage 18 was a time trial and our PEZman, Ed Hood was there to see Chris Froome dominate the day. The speedo says 60 kph: he's stroking a big gear on a low but smooth cadence on the flat, beautifully surfaced main road out of Sallanches. 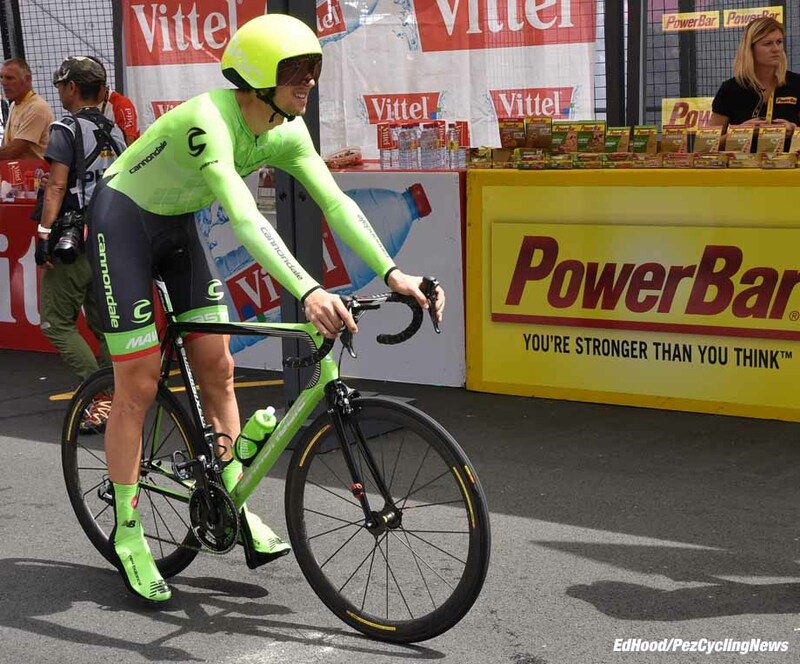 'He' is Cannondale-Drapac strongman Ramunas Navardauskas who we're following in the Stage 18 time trial. It's a warm day without much wind and nice for a short time trial of just 17K duration - except this one spends much of its time climbing a mountain. A good part of it is the Cote de Domancy which was part of the Worlds Professional Road Race Parcours in 1980 when Bernard Hinault bludgeoned his way to the rainbow jersey. The main road begins to drag and the big guy is down to 50 KPH; he's on a road bike but wears a skinsuit and aero helmet. He banks right into the climb, drops onto the inside chainring and very quickly settles into a nice fast pedaling rhythm. 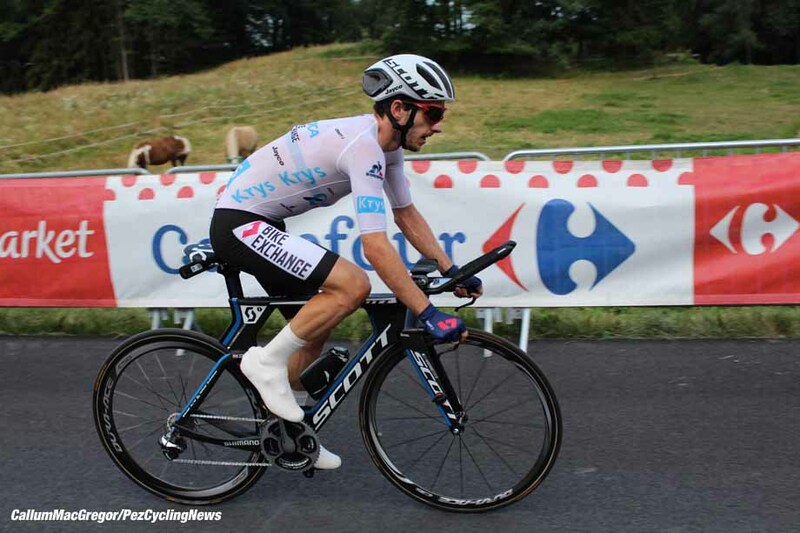 He's smooth and rarely out of the saddle but you can tell he's not attacking the hill, more trying to find the optimal ascent; not too fast - there are two days in the mountains to come and energy is at a premium. But not too slow, remember that time cut. The early part of the climb is beautiful, we climb through picture postcard perfect villages with the mountains as back drop. 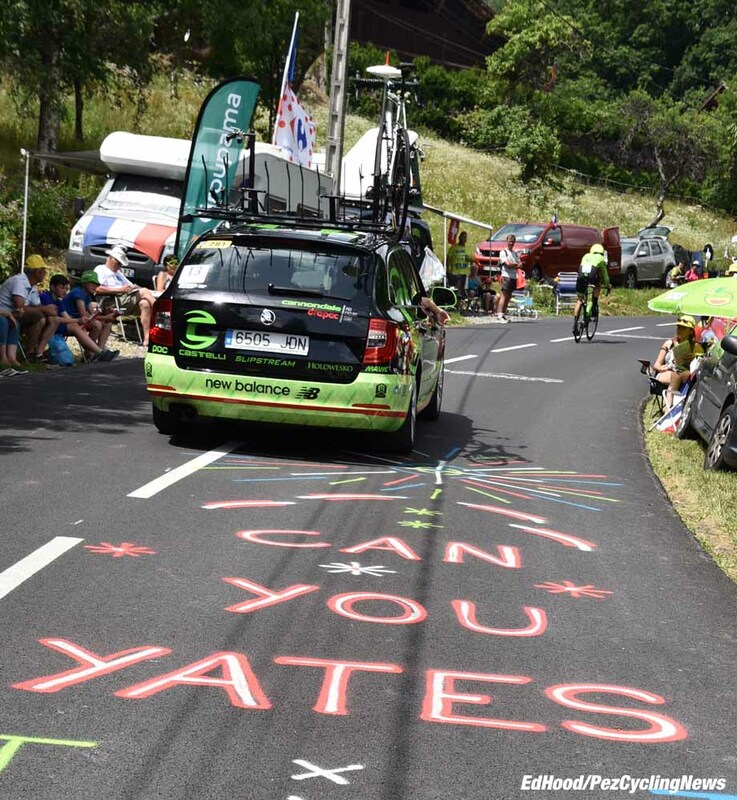 And the pavement artists have been out - albeit Yates didn't have the best of rides come the afternoon. 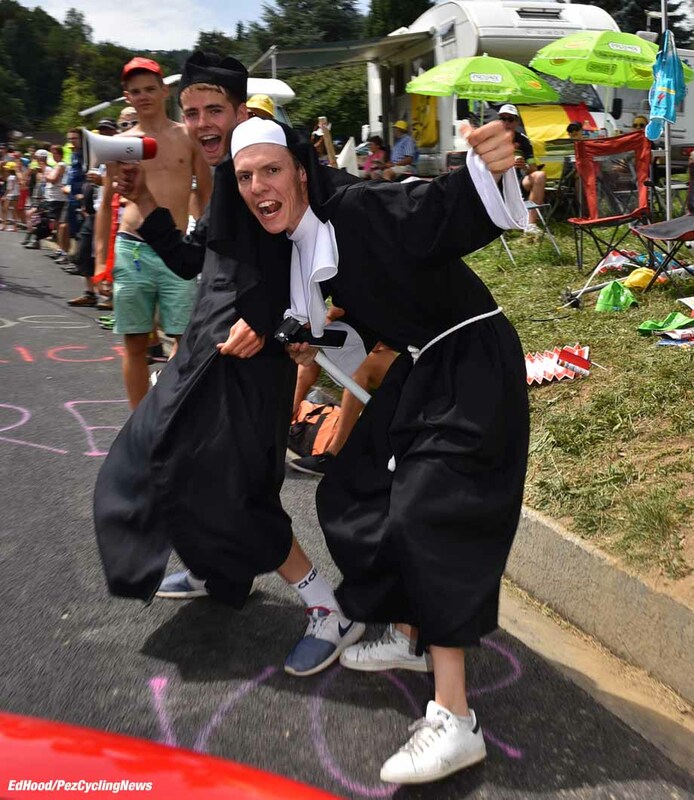 The crowds on the Domancy/Rue Bernard Hinault part of the climb are big - and enthusiastic but not too crazy - albeit those nuns will get missed from the convent eventually - although the fans thin as we turn on to the main road. There are false flats where he's back up to 30, even 40 KPH but we turn off the main road again and onto a narrow 'B' road which rears savagely and our man is certainly out of the saddle now. When he sits back down he's still finding it tough and those shoulders which were so solid are now bobbing as he struggles to keep even the tiny gear he's in rolling upwards. Big signs indicate how many kilometers to go - most would rather not know. There are more fans up here, they swarm to the toughest stretches - and the Eddy BH fans are loving it. Eventually the climb tops out and he's straight into an initially very fast but ever more technical descent with lefts and rights into the finish straight. 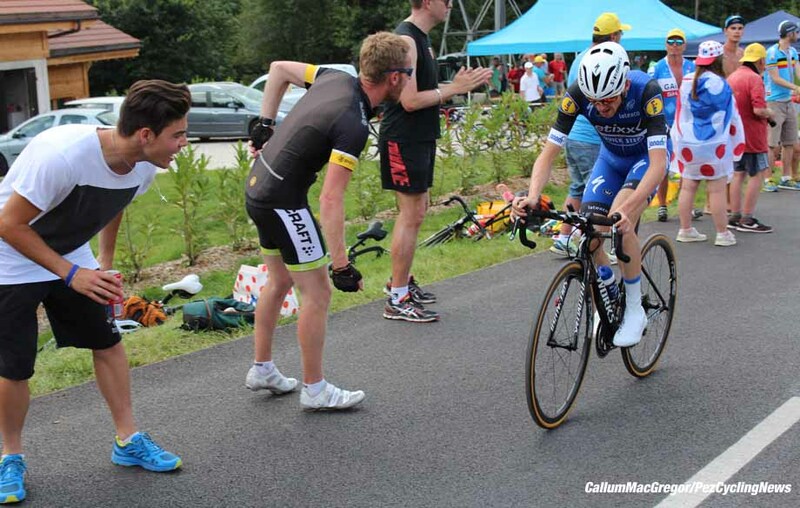 Navardauskas stops the clock on: 3:03 good enough for an eventual 54th place. 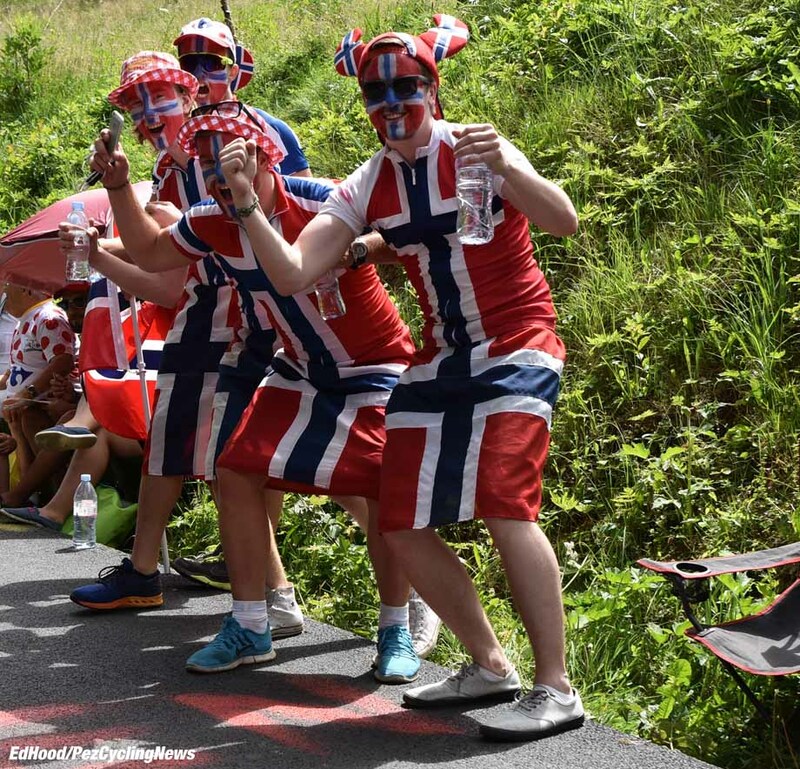 We won't bore you with the goings on it took to get to follow Big Ramunas but suffice to say if it was easy for "outsiders" to follow riders in Tour time trials then everyone would do it. 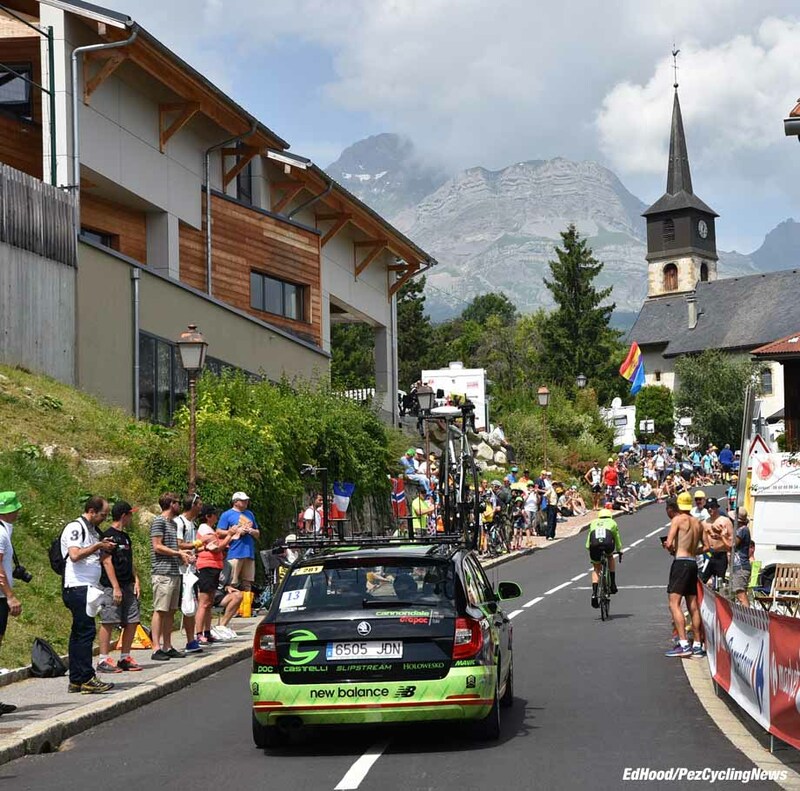 It's a good job we have friends on the inside - and patience, you need those before you can tuck in behind that Cannondale car. And that kir we had when it was all getting just TOO stressful helped. 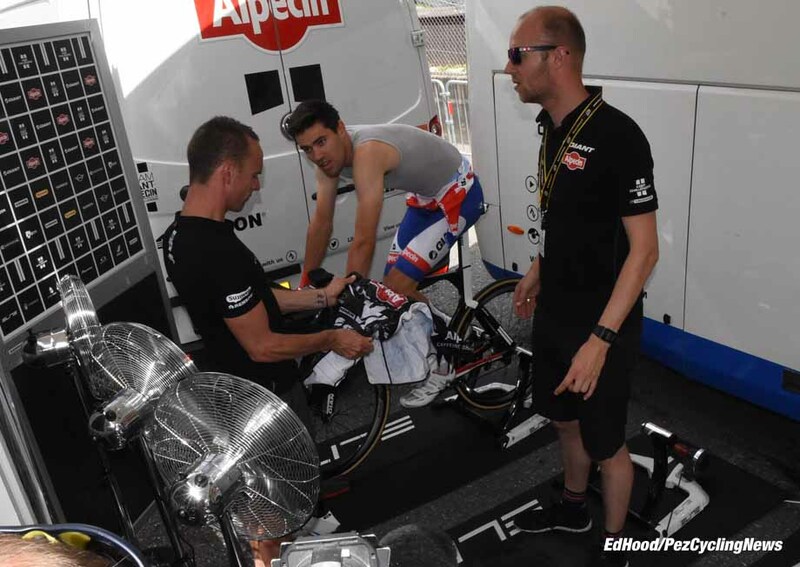 Race favorite Tom Dumoulin (Giant-Alpecin) uses fans, whilst breakaway specialist Serge Pauwels (Dimension Data) is an ice jacket man. 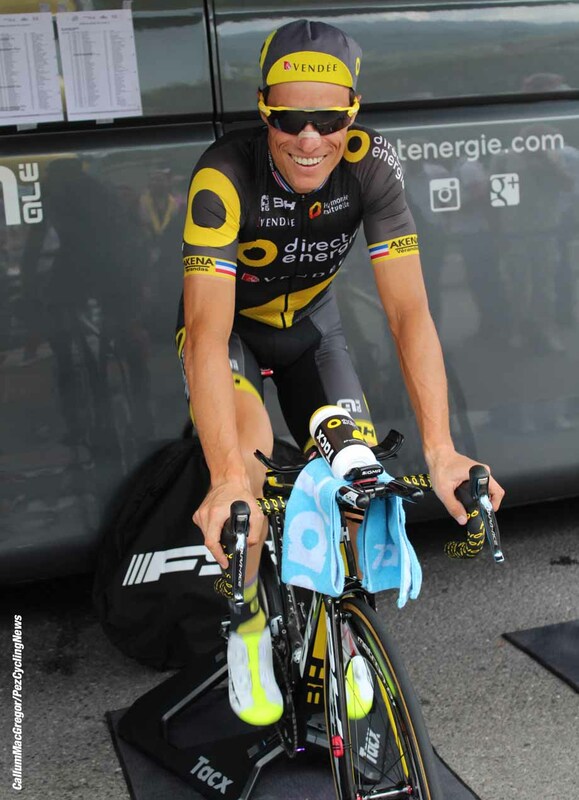 Just about all the teams warm up with their turbos set up so that they're looking out at their fans - the likes of Chava (Direct Energie) are happy to smile and chat. Meanwhile over at the Sky they prefer to stare at a black bus panel - then they wonder how there's not a lot of FanLove? And we know what we want for Xmas, a BMC 'Town Bike' with belt drive 11 speed hub gear, just like Fabio Baldatto's - but we could never look that cool. 'Sniffing' duly done it's time to get back up that hill to see 'The Bigs' in action. We split up so the Boss won't give us a row for having the same pictures. The first thing is that NO ONE looked anything other than cool, even the lowest placed finishers are a model of concentration and good form on a bicycle. 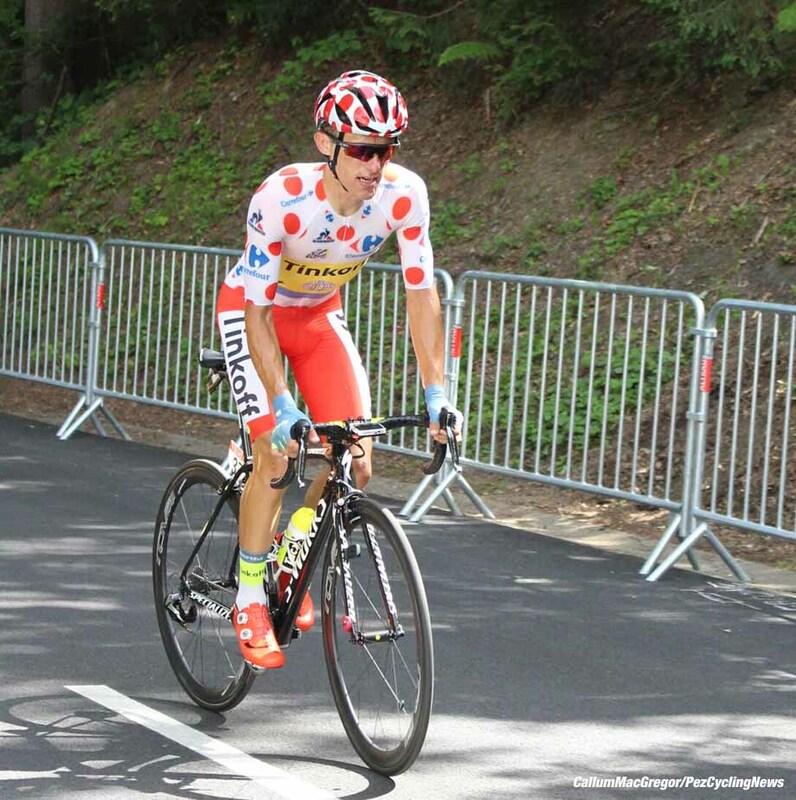 King of the Mountains leader Majka (Tinkoff) wasn't giving full gas but cut a colorful sight up through the forrest with his polka dots catching the dappled sunlight. 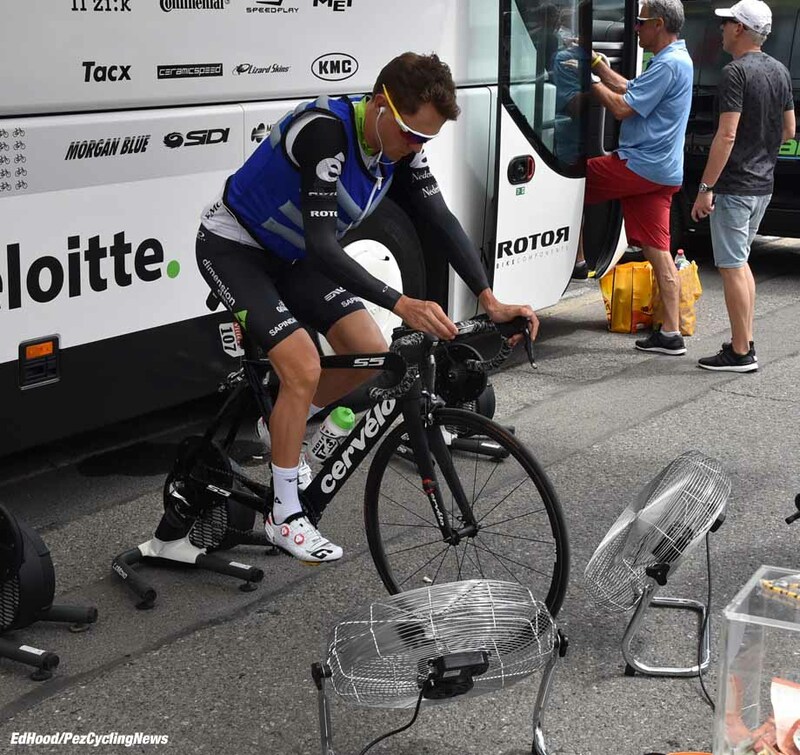 There was huge variation of hardware on display, some riders on their road bikes whilst the likes of Dumoulin and Froome were on full time trial rigs complete with rear discs. In between there were road bikes with disc wheels and with tri bar extensions. Perhaps a disappointing ride for Yates (Orica-BikeExchange), 16th @ 1:23 taking just two seconds out of Bauke Mollema (Trek-Segafredo) - we'd fancied he could leapfrog the Dutchman on GC this day. 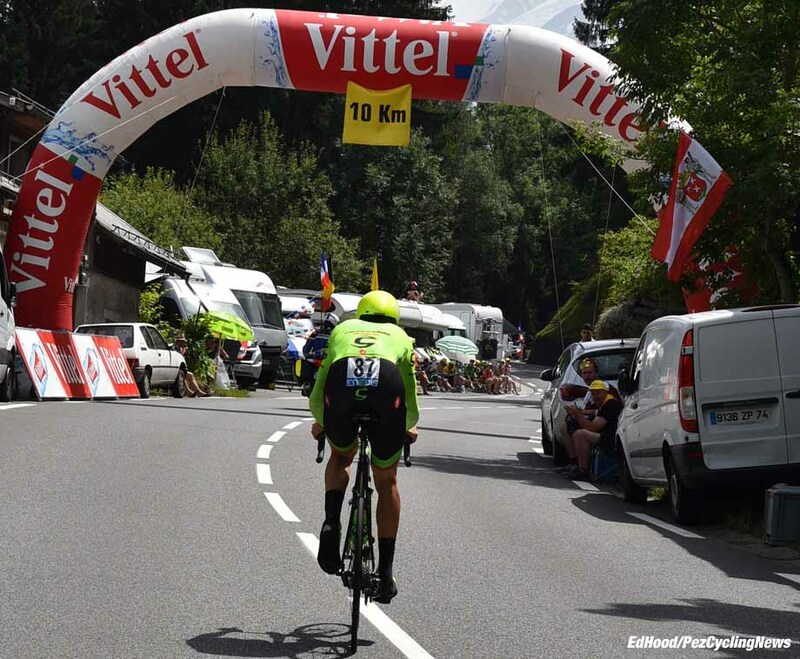 But it wasn't to be, he was actually well up on Mollema at our check but the nasty upper reaches of the climb would be more suited to Mollema and his road bike than Yates and his pure time testing machine. Dan Martin (Etixx - Quick-Step) rode to a decent time but dropped from tenth to ninth thanks to Lampre's Meintjes riding into a top ten on the stage. Aru (Astana) and Porte (BMC) rode strong races but Porte again got his pace judgement wrong, he was fastest at our check at Rue Bernard Hinault but slipped to fourth by the end. 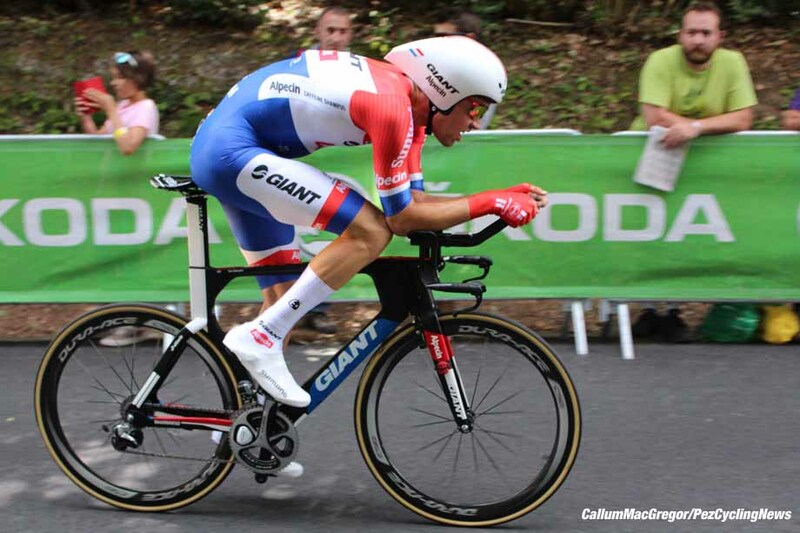 Dumoulin was the long time leader on that severe Giant testing machine but as most of us thought would be the case it was Froome putting the whole field to the sword and consolidating his GC lead. At our check Froome wasn't fastest but his pace judgement was much superior to the rest, realizing that there had to be petrol left in the tank for that horrible 'kick' to the top. 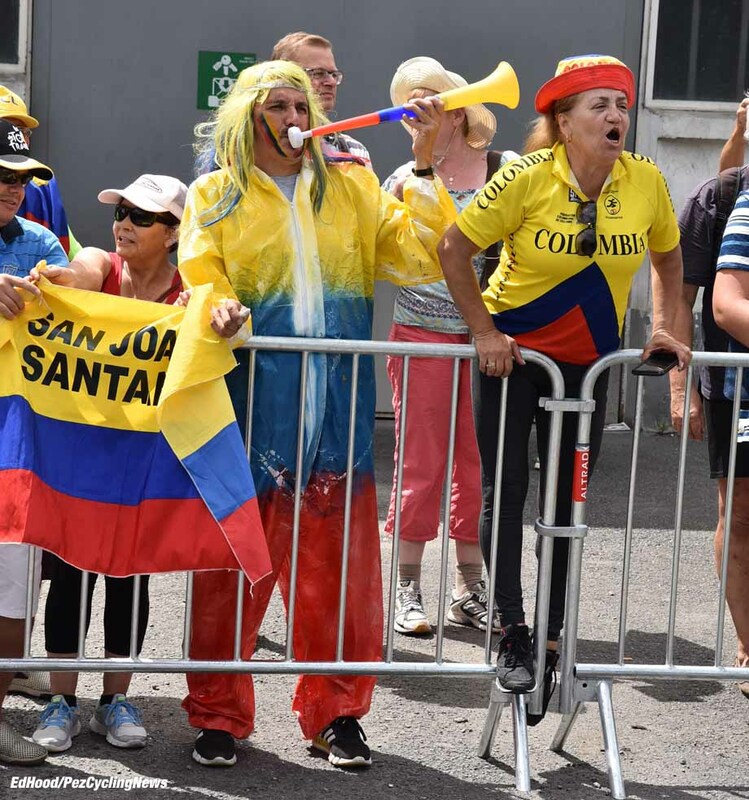 Apart from his dare devil descent to win Stage Eight, Froome hasn't been a 'force of nature' on this Tour but he's quietly built a solid lead and since he pulled that maillot jaune on has never looked remotely like losing it - foot races excepted, of course. 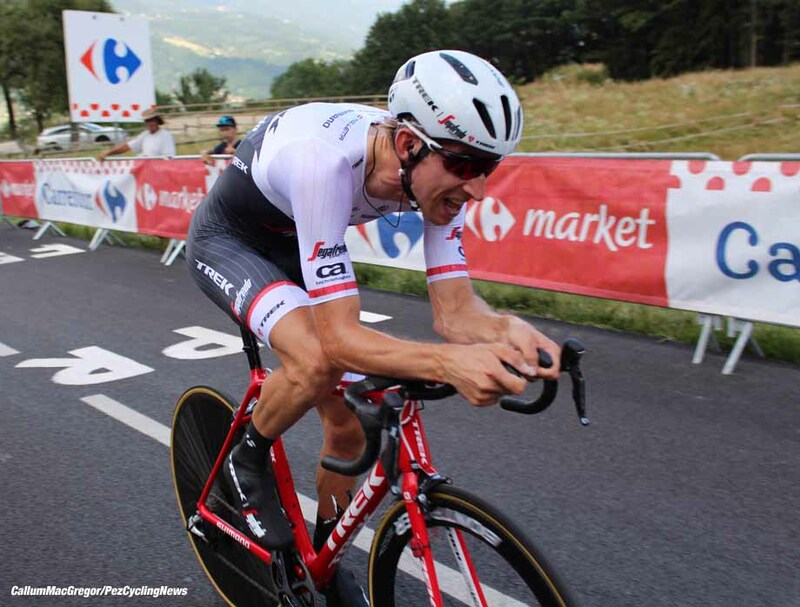 Mollema is no danger, a podium place is a great result for him and his team and he'll do nothing to jeopardize it. - and remember that he has another Brit breathing down his neck, in third spot. We were talking to Orica-BikeExchange main man Gerry Ryan t'other day and he told us that their target for Yates had been top ten. His current podium spot is a delight to them and whilst second is always better than third they'll do nothing to endanger what he already has. 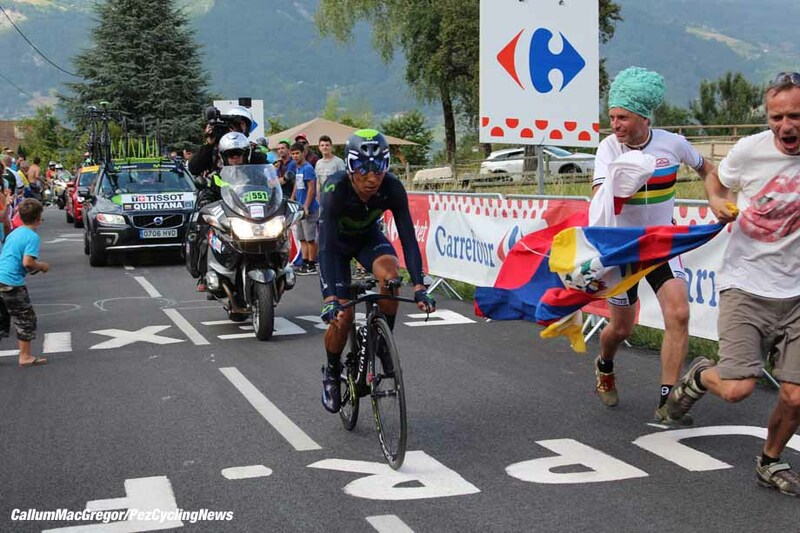 Quintana is in fourth spot and has two days to find the form that saw him distance Froome on l'Alpe d'Huez last year but that's highly unlikely. 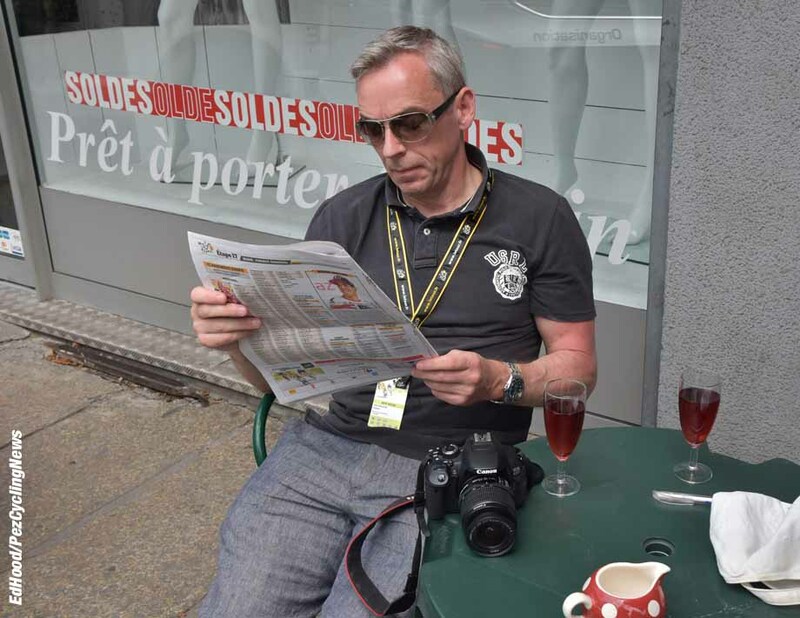 But, anything can and does happen in this Tour so we're looking forward to another two days in the Alpes - but first; "are you sure it's only 31K to the digs, Callum?"